The combination of remote data transmission (telemetry) and measuring instruments with electrical output signal opens up new possibilities to increase the efficiency of the process. One example of this is WIKA´s Cryo Gauge concept. 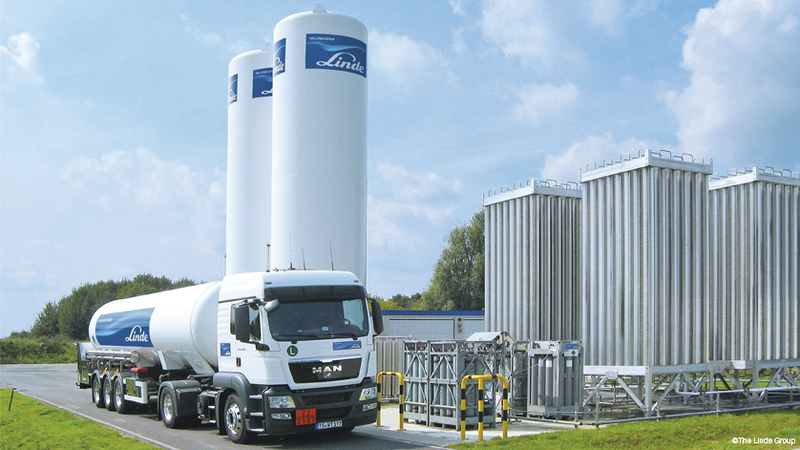 With this, the replenishment for a network of liquid-gas tank farms can be centrally managed. This M2M system can also be transferred to other applications. The differential pressure gauge of the Cryo Gauge measuring system. The second electrical output (rear) belongs to the built-in process transmitter for the working pressure indication. This measuring instrument monitors the filling level, which is derived from the differential pressure between liquid and gaseous phases in the tank and is displayed on a scale. Via a contact-free, magnetic coupling (rotary encoder), an integrated transmitter converts the position of the pointer into a 4 … 20 mA signal. Thus, the electronically transmitted and the locally displayed values always match exactly. Why a mechanical differential pressure measurement? It ensures, independently of the measuring range, an accuracy which is always up to 1%. Solutions based purely on transmitters frequently compare the difference between two individual measurements. This can, especially with small vessels, lead to measuring errors in the range of 10% and more. The working pressure indication for tank safety is combined with a valve manifold. This combination of mechanical and electronic measuring components adds to tank safety. If, due to external influences, the working pressure increases over a particular value, the excessive pressure (and with it also the gas) is vented to atmosphere via a safety valve on the tank. 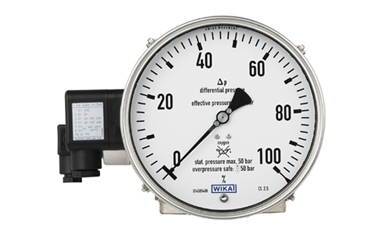 This working pressure is monitored with the mechanical display (pressure gauge), but also via the output signal of a built-in process transmitter. 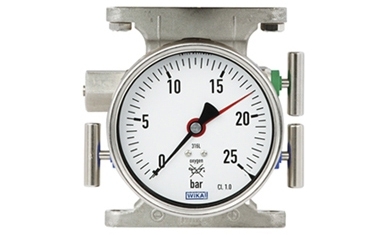 The pressure gauge is mounted onto a multi-functional valve manifold. This enables the isolation of the entire measuring system, for example, during maintenance tasks on the tank. 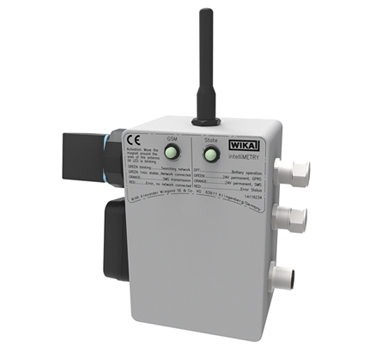 The telemetry instrument from WIKA picks up the electrical output signals of both the measuring components (fill level and operating pressure). It digitises the analogue measured values and transmits them via GSM technology to an online data centre (GPRS or SMS mode). In the event of any malfunction in the network, the data are buffered until the next possible routine call. The transmission interval is defined in accordance with the customer. The intelliMETRY module, in addition to the data transfer, also features monitoring functions, for example, the triggering of a warning message on any unexpected, rapid drop in the filling level. You can find more details on the Cryo Gauge concept in the flyer “Intelligent level monitoring” and also under the product information on the WIKA website (differential pressure gauge, model 712.15.160).